IN OUR HOUSE….. 1) Open all windows in the house and allow fresh air and sunshine to enter the house. Free flowing air and sun are excellent negativity removers. Keeping the windows closed prevents positive energy from coming inside your house and negative energy from going out. 2) Throw out all the clutter out of the house. Clean your house. Dispose of all the old unwanted things lying in the house. Clutter is a negativity magnet. It attracts and accumulates negative energy in the house. 3). Walking barefoot in the house helps all your negative energy to be absorbed by the earth. Walking barefoot on grass is also an excellent way to ground yourself. 4) Always leave your footwear at the entrance of the house. Our footwear collects negative energy. Hence in the olden days, these were kept out of the house. People used to enter the house only after washing feet with water. This action ensures that all the negativity remains outside or are grounded by earth and does not enter the house. Now it has become difficult to keep the footwear outside. So preferably remove them near the entrance door. 5) Go out in the open air. Take walks in the garden or open ground. Being amongst nature re-energizes or charges you fully. 6) Sweeping the floor also ensures that the negative energies are shaken and moved out with the dirt. 7) Rock salt is another negativity remover. Wash or mop your floor with a fistful rock salt in a bucket of water. This ensures that every nook and corner of the house is rid of negative energy. 8) Potted plants or trees around your house or society also ensures more positive energy in the house and area. 9) Bathing or Soaking your legs and hands in rock salt water once in a while removes the negativity attached to your body. 11) Repitition of Prayers, increases the positive vibrations in the house. 11) Keep your thoughts, action and speech Positive. Negative thoughts will bring in negative vibes. So avoid all negative thoughts, speech and actions. 12) Keep your house well lit and illuminated. Light removes negativity. 13) Keep faith in God and in yourself. 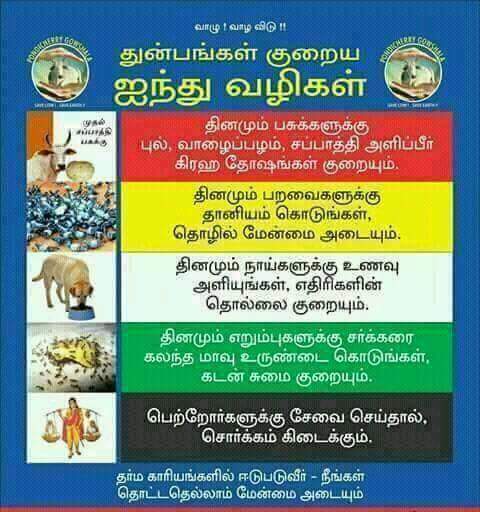 சிவ சிவ என்னச் சிவகதி தானே! -திருமூலர் இந்த சிவ மந்திரம் திருமூலர் அருளியது. இந்த மந்திரத்தை தினமும் மற்றும் சிவ வழிபாடு செய்யும் பொழுதும் சொல்லி வந்தால் நல்ல பலன் கிடைக்கும்.